I was busy baking cookies this afternoon, requested by LT, whose birthday is coming soon. He wants to give the cookies to his classmates. I was hoping he won't ask me to bake cookies for his friends as I was lazy to bake so many cookies, and yet I'm happy he still wants me to bake cookies for his friends. Not sure if I even make sense, lol. I'll still be busy baking tomorrow, still not done with the cookies and I've to bake his cake as well. 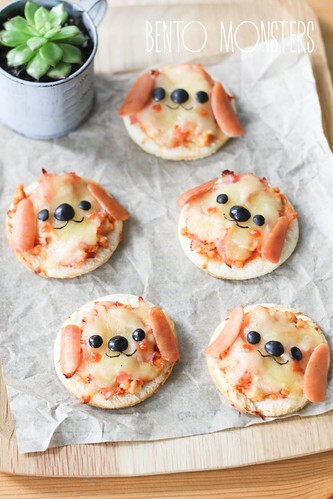 For today, I'm updating those doggy pizzas I made two months back. 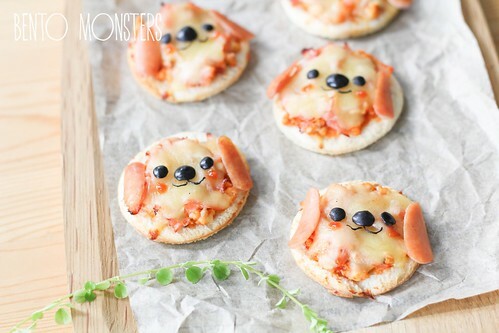 Similar to the cat pizzas and bear pizzas I shared before, these are also made from bread. 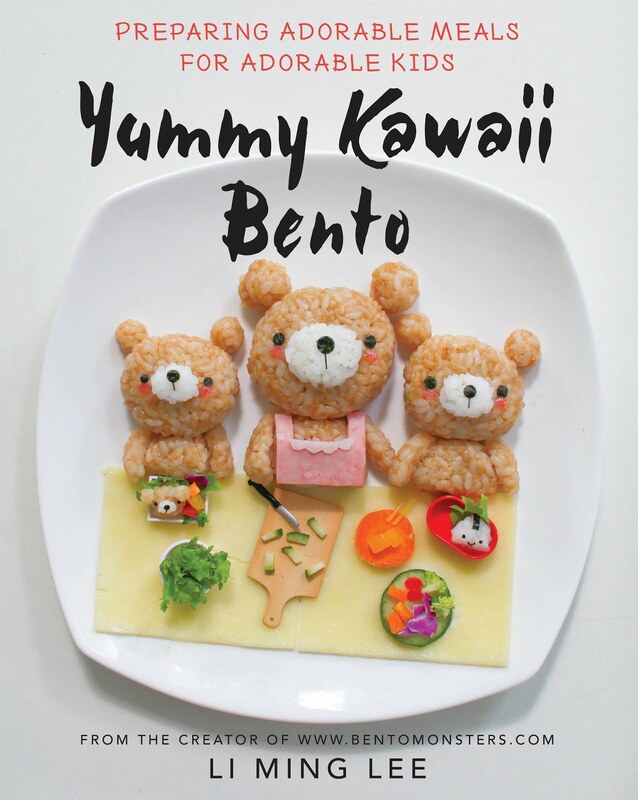 My boys love eating these, they are quite easy to make, can be served as a snack or as a main meal, and are also suitable for packing in bentos. They can also be made the day before and kept in the fridge, just toast lightly the next day before serving. 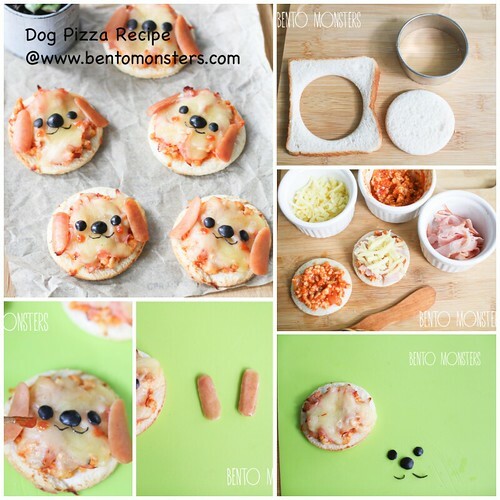 I've taken photos to show the steps in making these doggy pizzas. 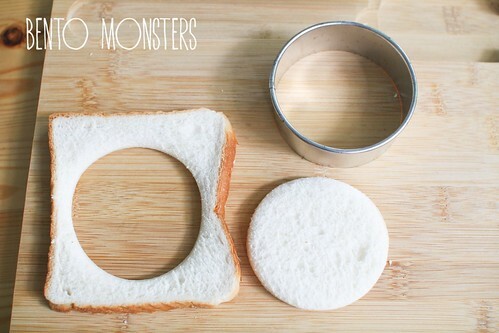 First, cut out bread using a round cutter. If you do not have one, a bowl will work as a cutter too. Toast your bread on both sides for 1 minute each in a preheated oven at 180 degrees celcius. I used chicken bolognese as the spread and top with shredded ham and shredded mozzarella cheese. 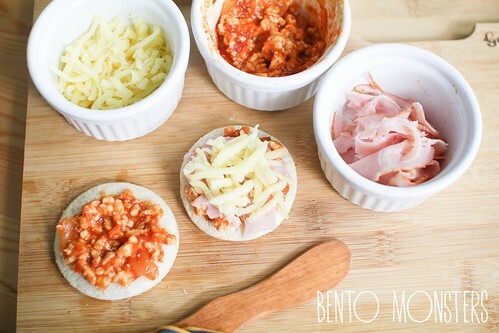 You can also use tomato sauce, tomato paste, pasta or pizza sauce to spread on the bread and add on any fillings you like. Return to the oven and toast till the cheese melts. 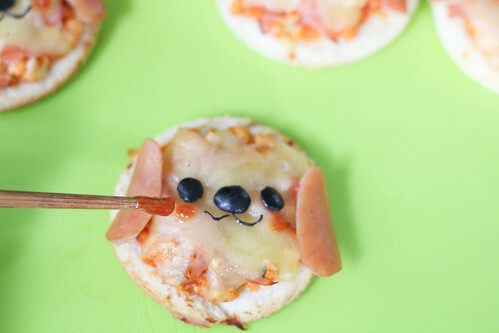 Using olives, cut out the dog's eyes, nose and mouth. Slice cocktail sausages in half for the dog's ears. This step is optional. You can return the pizzas to the oven and toast till the cheese starts melting, so that the olives and sausages can "stick" onto the pizzas. Dab on ketchup using a chopstick. 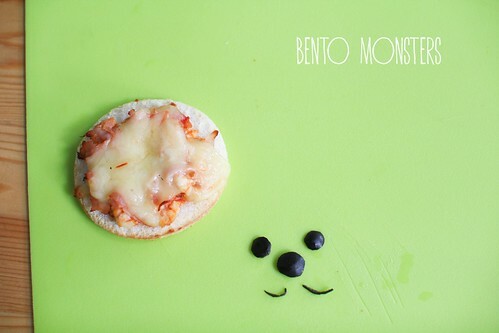 If you do not want to deal with leftover bread cut outs, you can just make a square doggy pizza too. And if you need ideas on what to do with the leftover bread cut outs, check out my old post HERE. 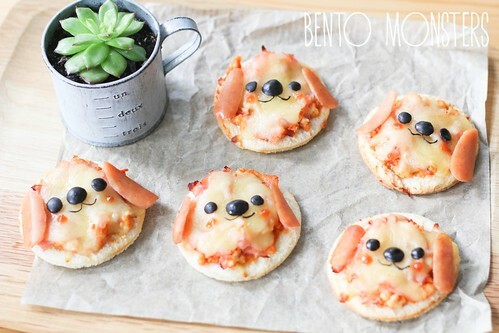 Super cute pizzas. Your kids are blessed with a wonderful mummy like you! 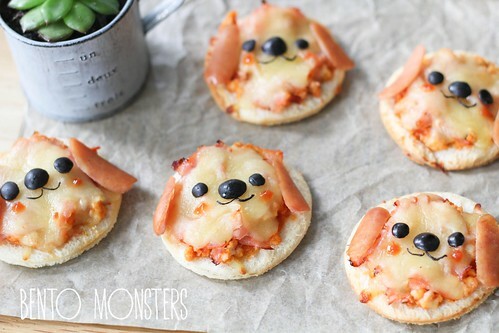 They are super cute and look so yummy! 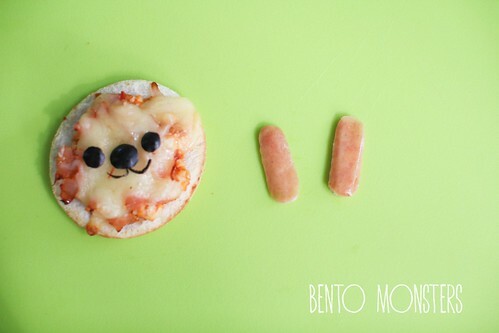 I still remember the bear and cat ones that you made before, all are way too cute! tq for the tutorial.. i will try this one..